p at 6:00AM again, but this time Tammy wakes up at the same time, so we both sneak out to watch the sunrise again. Romantic, eh? Granny(J) is already down on the beach as we can see her in the distance. The sunrise today is not quite as spectacular as yesterday but still beautiful. To complain would be a little like moaning that you only won £5 million today when you won £6 million yesterday. Its just a question of to what degree is it sensational. There seem to be even more birds around this morning including pelicans, cormorants, crested gulls and all sorts of others that I dont know the names of. Look, I dont know EVERYTHING, OK? Back in the condo we have breakfast and then ring up Billys Bikes to find out the whereabouts of our missing bike. The man tells Tam that we have only paid for 4 when we know we have paid for 5. So we jump in the car to go and sort it out. Tam and Granny(J) have steam coming out of their ears and are spoiling for a fight. When we get to talk to Billy (well, it probably isnt Billy himself, but one of his minions. Billy is probably still tucked up in bed enjoying the rich rewards of owning a bike rental business in Sanibel) anyway, we are told that we have only paid for 4 bikes and he shows us the paperwork to prove it. Deflated, the women say thank you and go to pick up the bike, the chance of a good argument ripped from their grasp at the last minute. You only ever see a look like that on my face when I spill my beer. Back at the condo we load up the bikes and set off on our ride at 9:15AM. 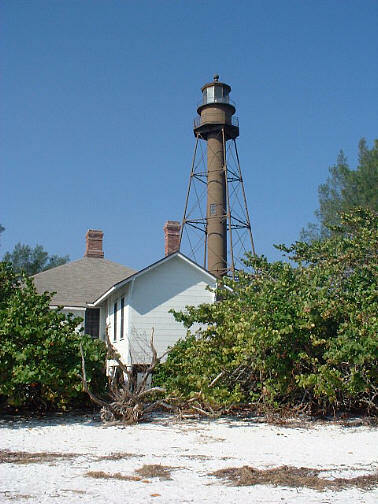 We cycle along East Gulf Drive to the Sanibel Lighthouse. This is a relatively old structure by American standards (about 100 years) and its rusty appearance adds to its appeal. It is situated on a small peninsular with mangroves at the waters edge and the sea lapping at the white sand beach, although you cant swim due to dangerous currents. Granny(J) asks Tam to check how many pictures she has left in her camera. Tam looks and laughs. There isnt a film in at all. 3 days of snapping away with no film. Son-in-law immediately sees opportunity for much taking of the mickey for the rest of the holiday. 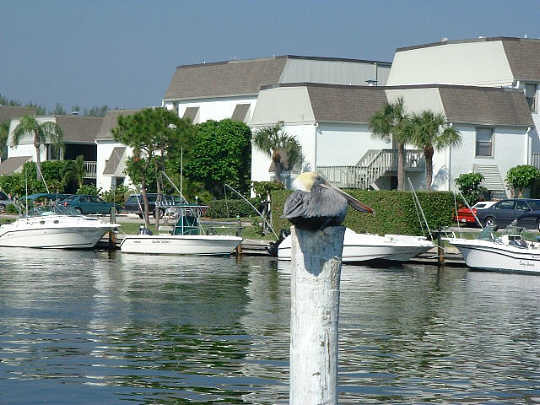 Back along Periwinkle Way to the Sanibel Marina where we gaze upon the wonderful boats with envious eyes. The waterfront houses are also beautiful. Mind you, it is hard to find a house in Sanibel that isnt lovely. There are so many little inlets with waterfront dwellings and boat moorings. Back on Periwinkle Way we cycle for a couple of miles before an ice cream seems like a good idea. Huge waffle cones full of cookies n cream and espresso chip ice cream are consumed before we jump back on the bikes. Another mile on up the road and we stop at a supermarket to buy chicken and subs before riding on down to the beach. Straight into the sea we all go. Tam finds that the seabed has lots of shells, which she feels with her feet and then bends down to pick up. Finest shelling feet in all of Sanibel has Tam. Lunch is taken and we all relax for a couple of hours. Back on the bikes and we cycle back along Middle Gulf Drive to the condo via another beach. We arrive back around 4:30PM and I enjoy a cold beer (two actually) while the children swim in the pool. After a shower and a glass of wine we are off out to dinner. We have discovered a restaurant at the Sanibel Inn just up the road called the Portofino, which is supposed to be very nice, so we are going to give this a try. Now, this is a very classy establishment, on a par with the better Disney restaurants. Our meals include scallops, steak, bruschetta (yes, I know Ive probably spelt it wrong) and hot dog for Georgia. This poor description does not do the food justice as it is of very good quality. The service is also exceptional. Attentive, but not overly so. Iced water and bread and olive oil before the meal. A couple of bottles of nice wine (Woodridge Cab.Sav.) also help. I really could not fault this meal. Of course, the bill has to reflect this at $160, but this is reasonable for a meal for 6 with wine, tip etc. I do believe the ladies are a bit squiffy as we take the short walk home. Scrap that. I KNOW the ladies are squiffy. Once back, I persevere with a couple of beers while Granny(J) and Grandma(D) have tea and coffee and Tammy promptly falls asleep on the sofa. The girls are wide awake and start a game of Charades. I tell you, you have to see Georgia attempt to portray Winnie-the-Pooh to really appreciate toilet humour. Grannys(J) legs have gone by this time and we are thinking that she will have to crawl to bed, but she musters all the dignity that one can in such situations and makes it to the bedroom standing up. The ladies have managed to last until 10:30PM tonight, things are looking up! The weather. Im not sure that it could be more perfect. 80 degrees and clear blue skies during the day. 70 degrees and not a puff of wind in the evening. Whats more, the forecast for the next week is more of the same! My mother, Grandma(D). At 76 years old she has cycled the best part of 10 miles, drunk with the rest of us and still had the energy to play with the hyperactive children at the end of the night. I may not tell her often, but she is an exceptional woman and I am very proud of her. She better be up to make my breakfast in the morning or theres going to be trouble!